It is always fascinating how some people can eat fast... and with that... there was recently a face-off of gastronomical proportions when hungry tummies and focused appetites faced their main competitor - the Tony Roma’s Bountiful Beef Ribs! 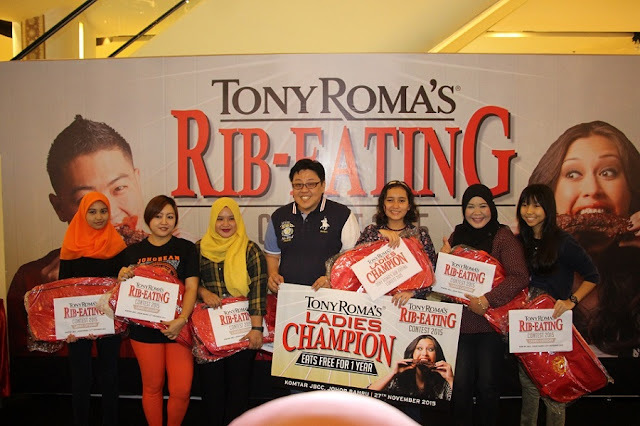 In the highly anticipated Tony Roma’s Rib-Eating Contest 2015 finale, eight male and eight female finalists each from Johor and the Klang Valley geared up their appetites to be crowned the ultimate Rib-Eating champion at Komtar JBCC, Johor Bahru on 27 November 2015 and Citta Mall, Ara Damansara on 28 November 2015. The female contestants had their challenge cut out for them in the form of Tony Roma’s indulgent Beef 3, while the men competed with the “heavyweight” Beef 10! The smell of barbeque filled the air as the contestants suited up for their feast with one important rule - they had to finish the ribs with Tony Roma’s original BBQ sauce all over their faces in the fastest time! 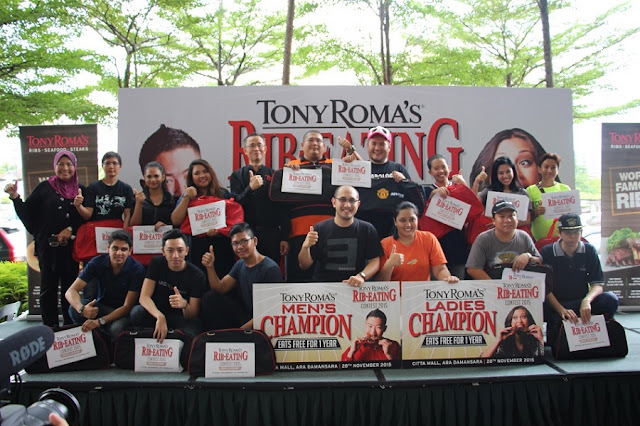 The Klang Valley Tony Roma’s Rib-Eating Champions. From left to right: Meor Ezammer, Rib-Eating Champion-Klang Valley Men’s Category; Mr. Adam Mah, Business Unit Manager of Grand Companions Sdn Bhd and Nurul Nadiah Che Mat, Rib-Eating Champion-Klang Valley Ladies’ Category. 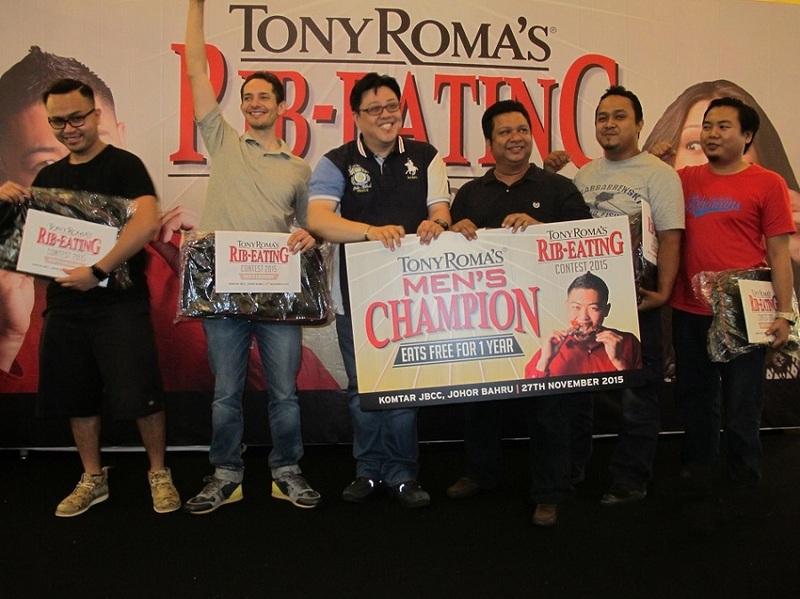 At the nail-biting grand finale in Johor; Abdul Halim Afandi clinched the title of Champion Rib-Eater in the men’s category with a time of 13 minutes and 31 seconds. The female category was won by a 12 year old, Aalia Zaafira who finished in three minutes and 17 seconds. At Citta Mall, Meor Ezammer was crowned Rib-Eating Champion in the men’s category at eight minutes and 49 seconds while Nurul Nadiah Che Mat grabbed the champion title in the female’s category at two minutes and 29 seconds. Kudos to the winners....and enjoy eating free for the whole of next year....!!! 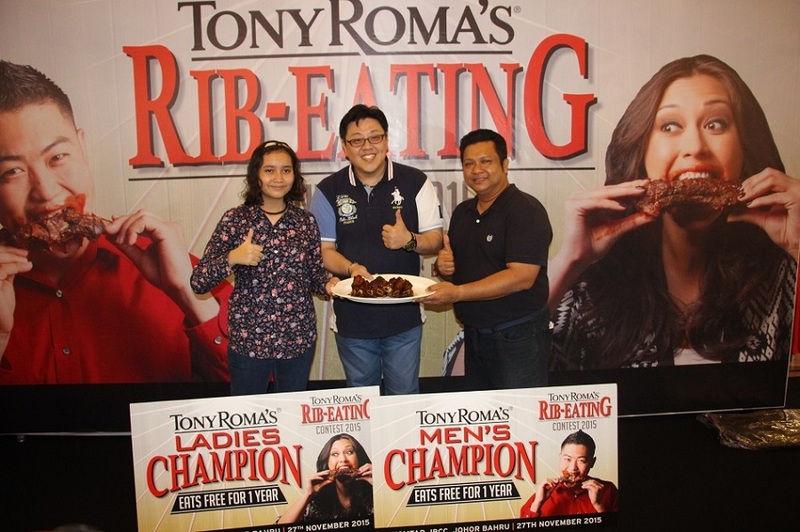 From left to right: Aalia Zaafira, Rib-Eating Champion-Johor Ladies Category; Mr. Dickson Low, Chief Operating Officer of Revenue Valley Sdn Bhd and Abdul Halim Afandi, Rib-Eating Champion-Johor Men’s Category. Tony Roma’s Malaysia is celebrating its 10th Year Anniversary and offering amazing promotions all year along at all Tony Roma’s outlets. Among others, these promotions include the awesome Early Diners: BUY 2 FREE 1 promotion, the latest Tony’s Timeout menu, the Set Dinner menu and the Kids Eat For Free promotion.